Holt Renfrew, Mac Cosmetics, Fairmont Hotels and McDonald’s were all represented at the UFV Trades and Technology Centre in Chilliwack this week. 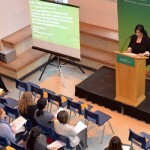 The Hospitality Event Planning program hosted its annual trade show on customer service strategy on Thursday morning, called Go to School on a Winner. The event saw pairs of students present a booth on their chosen business, displaying pictures, products and posters summarizing a month-long research project. They had to choose a business that excels in community and customer service, as well as in employee relations. Each group had to interview the marketing director or human resources director of their chosen business. “It gets them into the city, and helps them learn about what the company does for the employees and what they are doing to give back to the community,” said instructor Nancy Barker. One team, Jenneke Franken and Alison Starkey, chose to research WestJet. Their popular slogan, “Why do WestJetters care so much? 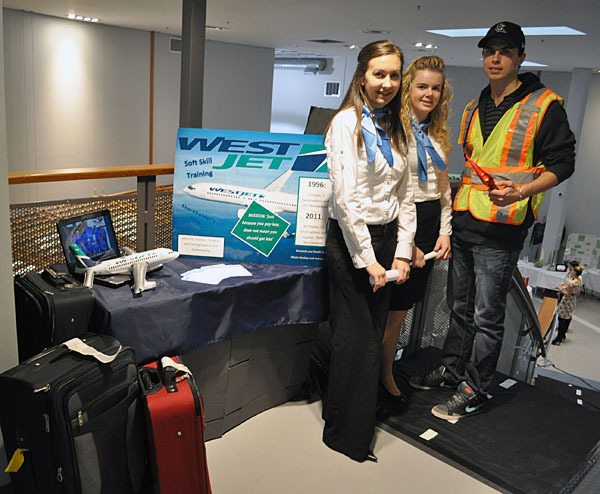 Because we’re also WestJet owners,” intrigued the students. Franken and Starkey’s biggest challenge was putting together their display table, and ensuring it was something that would grab people’s attention. Taking into consideration WestJet’s go green campaign, they used a computer to display their images, and printed off only a few brochures. Dressed in airline attendant outfits, the team also brought in suitcases. And the largest draw: an air traffic controller dressed in a yellow vest, complete with hand-held orange lights, pointing visitors down a home-made runway.